Vowed never to wear platforms? 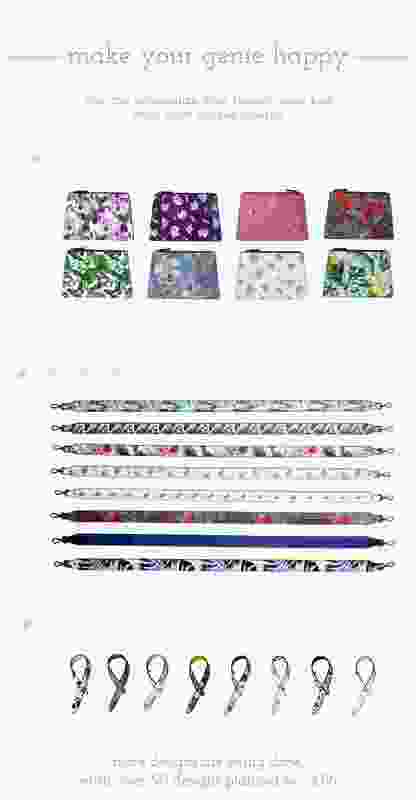 Big logo belts? Did someone say Crocs? How about adding snake skin, kangaroo skin, alligator skin to this list?! Hit the fashion refresh button readers because sustainability in fashion isn’t the only catwalk to closet trend. Vegan fashion is on the rise and it’s time we embraced it because it is sustainable, cruelty free, stylish, cool and most importantly kangaroos, alpacas and little lambs are just too damn cute! Vegan fashion and textile materials such as micro-suede, faux cashmere, and cotton canvas are replacing leather, fur, wool, skin, exotic skins or any other animal derived ones to introduce a new line of Vegan Couture. We recently brought to you how Gucci decided to go fur free from 2018. Many brands like H&M are setting sustainable and vegan fashion standards with their line of vegan-friendly clothing, lingerie and accessories. And then there are other innovation brands like Orange Fiber revolutionising the vegan fashion scenario with new fabrics out of food waste! At the recently held United Nations event on sustainability in fashion at COP23, our Founder delegate met Enrica Arena, co-founder of Orange Fiber, which uses using oranges and food waste to create gorgeous high-end textile fibres! Mind you the world of fashion is taking this innovation seriously with big brands like Salvatore Ferragamo using their textiles. We brought to you Enrica’s presentation at COP23 on the brand’s tech innovation and broadly on the implications of the Paris Agreement on fashion companies and their supply chains. Now we move from oranges to apples! Today we would like to introduce you to another vegan fashion accessories brand Happy Genie making the world’s first luxury vegan handbags from apples! These bags are 100% toxin free and PETA approved vegan which is a rarity in itself because many vegan goods are touted about but turns out their manufacturing processes or some ingredient in them is totally unsustainable and non eco-friendly like polyvinyl chloride (PVCs) etc. Meet the world’s first luxury vegan handbag made from apples. The range of exclusive bags are designed in Switzerland and hand made in Italy. Vegan handbags exist, but not ones made from apples! And certainly not luxury vegan handbags! Happy Genie is at the forefront of fashion innovation with a breakthrough technology backed sustainable offering that’s also cruelty free. 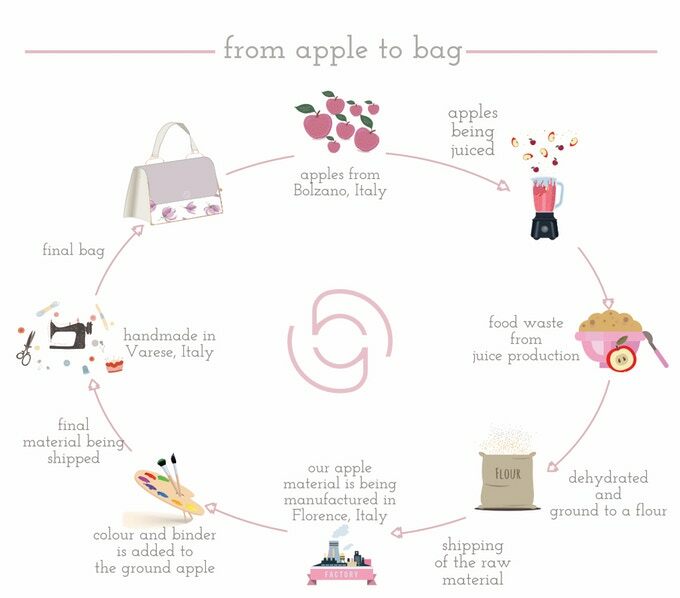 With features in top fashion magazines like Instyle, Eluxe Magazine, My Good Planet, Conscious Fashion Collective and others, Happy Genie became the first and only luxury brand to use raw material made from apple waste. Meet The Founder- from apples to vegan handbags! Tanja Schenker, designer and CEO of Happy Genie has previously created luxury brands with ethics in mind. Sustainability has always been key for her. The impact we have on our planet is at the core of her beliefs and form a large part of her vegan lifestyle and the vegan handbags she creates. The journey started four years ago, when she designed and created the sister brand, Genie in a Bag. 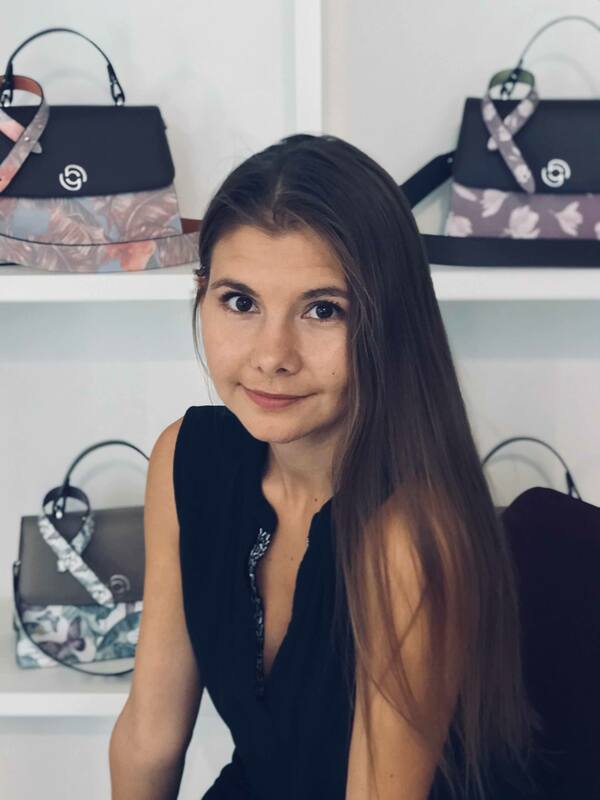 With the aim of designing a multifunctional bag which was made of high quality luxury materials but in an ethical way, she began travelling the world to source materials and for production. Two years later, a collection of women’s travel and business bags was launched. However, even with fantastic sales it didn’t seem enough. While travelling around the globe, Tanja experienced first hand, the sharp contrast of how unethical fashion can be, and the impact it has on the planet can easily overshadow the true beauty of the bags she used to love to buy. These experiences, led her to begin her vegan journey and creating a new collection which was cruelty free, with the goal to redefine vegan luxury fashion. Instead of using traditional recycled materials she began looking for unique ones. She then heard about this amazing invention of turning apple waste into a material which felt like leather and had the most luxurious quality. After testing and developing the product for a year, it was ready. 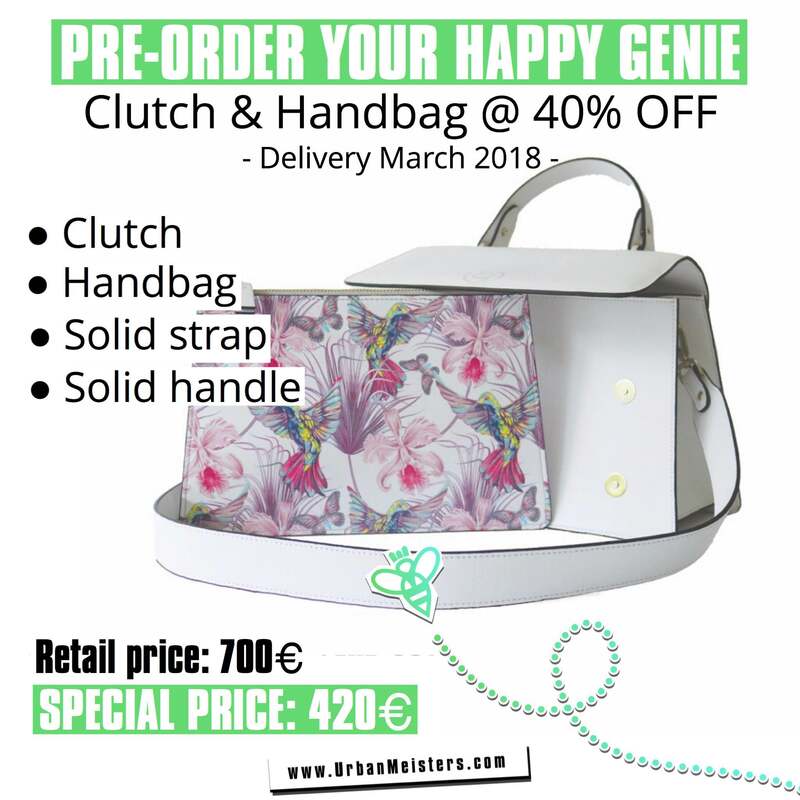 Happy Genie even developed an amazing way of printing on the material so their could be endless possibilities in designs, allowing consumers to keep the handbag and just change the clutch, handle or strap, to be on trend with the latest fashion styles, or go for a more timeless look. Happy Genie is named after Tanja’s beloved dog named Happy who passed away. She says “The bag was always going to be called happy, but how fitting it is that apples were his favourite food. So, this is a message for happy…we did it, and you will always be with me wherever I go”. 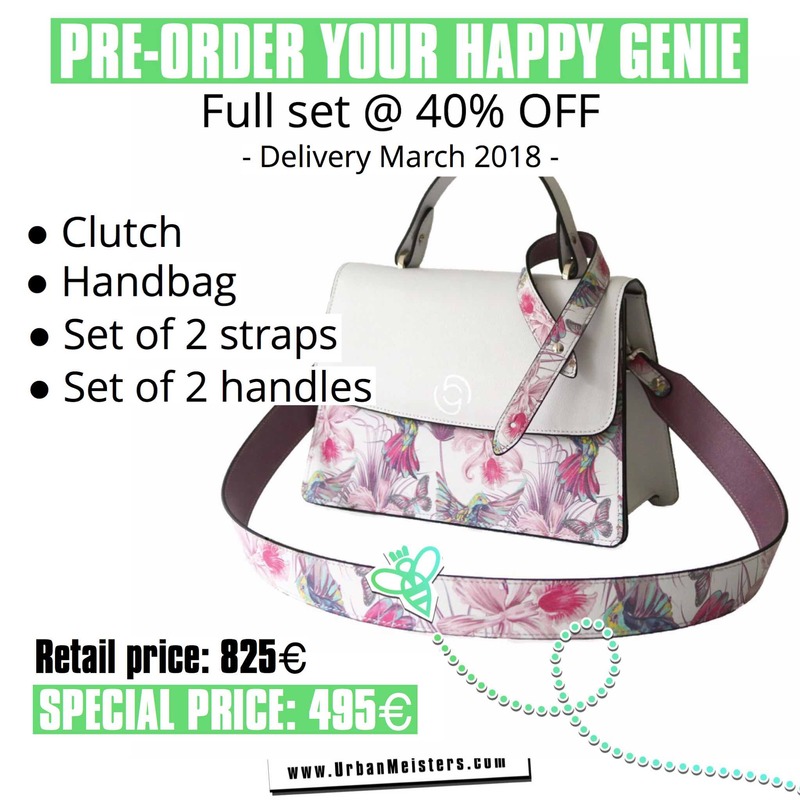 Happy Genie bags are the first of their kind and one of their kind. They are not only ethical but a brilliant example of effective waste management. Their raw materials are the waste of juiced apples. The apples from Bolzano Italy are juiced. Food waste from the juiced apples is then dehydrated and ground to flour. The flour is shipped to Florence in Italy for proper manufacturing. Colours are added to the ground apple. The final processed material is shipped to Varese in Italy where the bags are handmade. Et Voila! 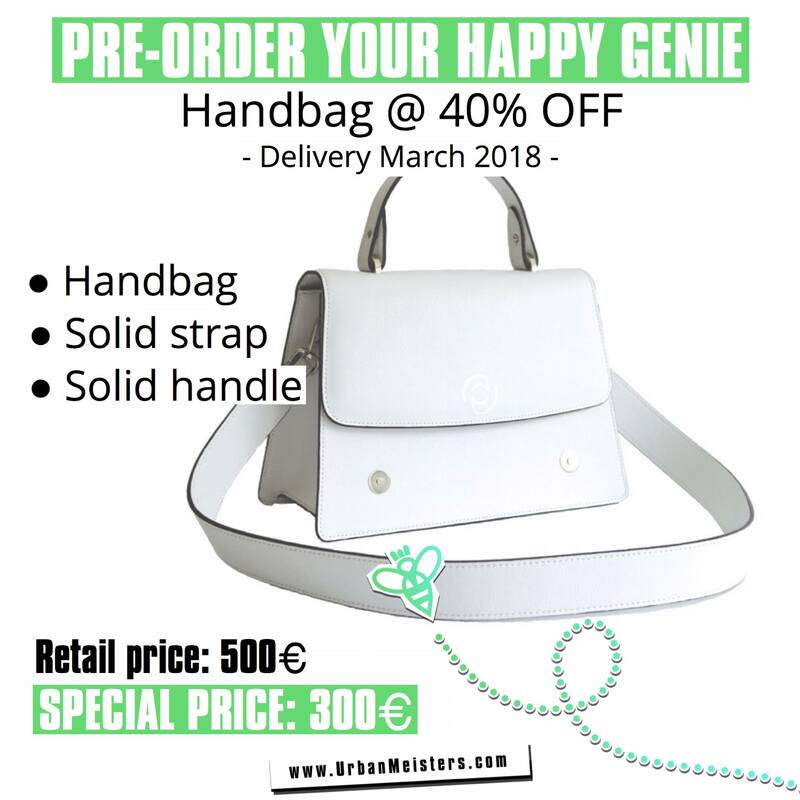 We have a luxury Happy Genie vegan handbag. These vegan handbags are 100% toxins free- the raw material is made from apples and the glue and colours used are all vegan too. The bags are PETA approved vegan with no use of toxic materials like PVCs and textile polymer composite microfibres. In fact the whole manufacturing process of the material is super eco-friendly. There is no use of dyes and tanning processes at all. The color is mixed with the raw apple material, which is then applied on canvas. There is also barely any use of water during the colouring of the raw material. The print is digitally produced onto the material. We would like to add here that the material, which is fairly a new invention, is still being tested for CO2 emission. The apple waste and the raw material originates in Bolzano, which is then brought to the manufacturing facility in the Northern Part of Italy (near the Swiss Border). The finished product is then sent to Zürich, Switzerland. The brand places great importance on keeping the production and manufacturing close to each other, avoiding long travel distances as well as maintaining the highest quality. So you see the bags are being made in an eco-friendly way- as much as possible. The bags make a great style statement and are extremely functional too- the true ‘all you need is one bag’ kind of bag! They come with a detachable clutch, a handle and shoulder straps. They are available in multiple colours and designs and can be customised with changeable clutches attached to the front. Additional customisation is also offered with the straps and handles. This increases the style life of the bag in a big way for the customer because you can just change up the look depending on your outfits and your needs! The idea is to make the vegan luxury handbags not a one off seasonal piece but a classic product that can ride the times, your needs and fashion trends. One bag really does have endless possibilities! They are water resistant and the zips and other metal components in Happy genie are metal-free and palladium plated. But the real hero here is the material made from apple waste itself. When prototypes were shared with ordinary people they were amazed that the material is actually not leather. It’s ‘soft’, ‘feels just like soft leather’ ‘amazing’ and ‘insane’ were the standard responses from anyone who came in contact with the bags. Watch below! Through their sustainable production the brand aims to inspire others. Happy Genie stands on 5 pillars to positively impact the environment and the future. Compassion– A deep love for animals. After year so of working in the fashion industry and developing a successful ethical sister brand, their new line cuts out animal products all together. Sustainable– Growing population and consumer consumption which results in increased waste can be combatted by recycling and effectively disposing waste. Happy Genie helps in solving the increasing waste issue by using waste from the food industry to produce high quality bags that our customers can use for years to come. Ethical– Happy Genie is dedicated to ensuring their customer’s investment in the brand rewards the manufacturers and suppliers. They provide work for the local community and make their supply chain happy. Fair– Quality usually comes at a price but at happy genie there is no compromise to increase profits. It is ensured that luxury products are of the highest quality possible. Customers pay for the products, no other overheads. Transparent– Happy Genie is happy to show case all suppliers, supply chain policies and practices, and environmental and social impact indexes. The brand shows you how the apple can fall from the tree and end up in your hands as a luxury product ;) Seeing is believing. 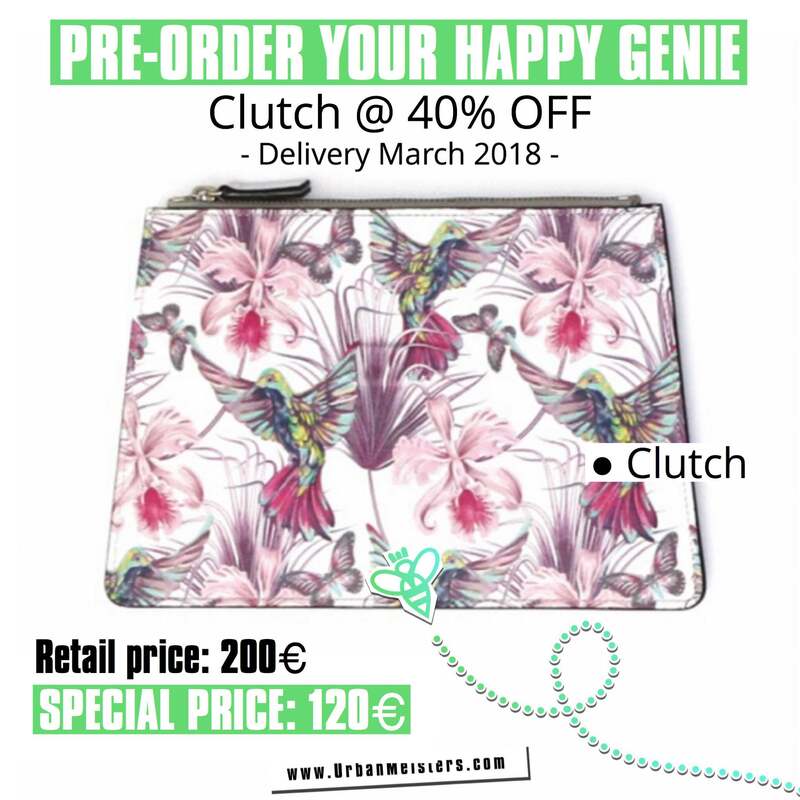 Happy Genie could be yours today at 40% savings if you want. Just pre-order at their special Indigogo crowdfunding set up which is selling their various sets on special prices. So what are you waiting for? Order Happy Genie here NOW! 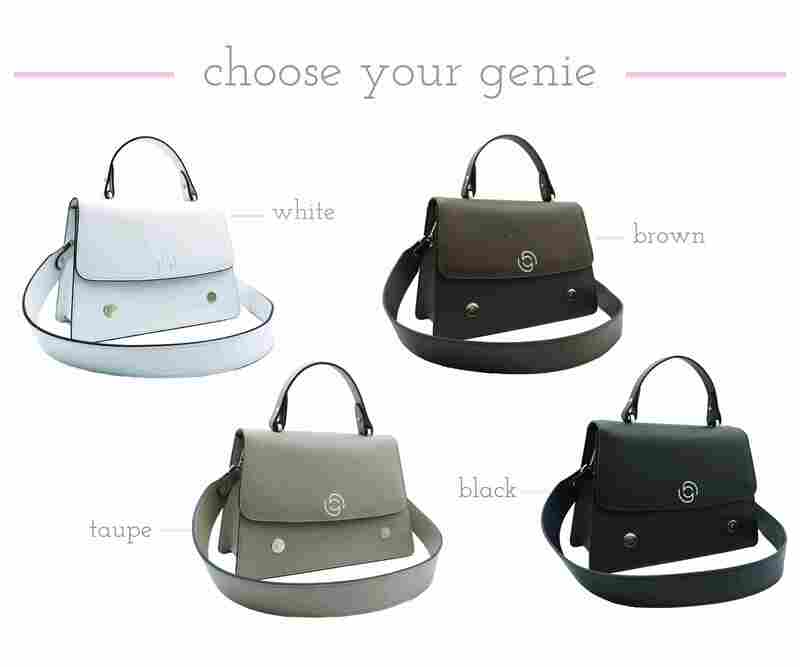 Instagram @happygeniebags or Facebook @Happy Genie for updates.